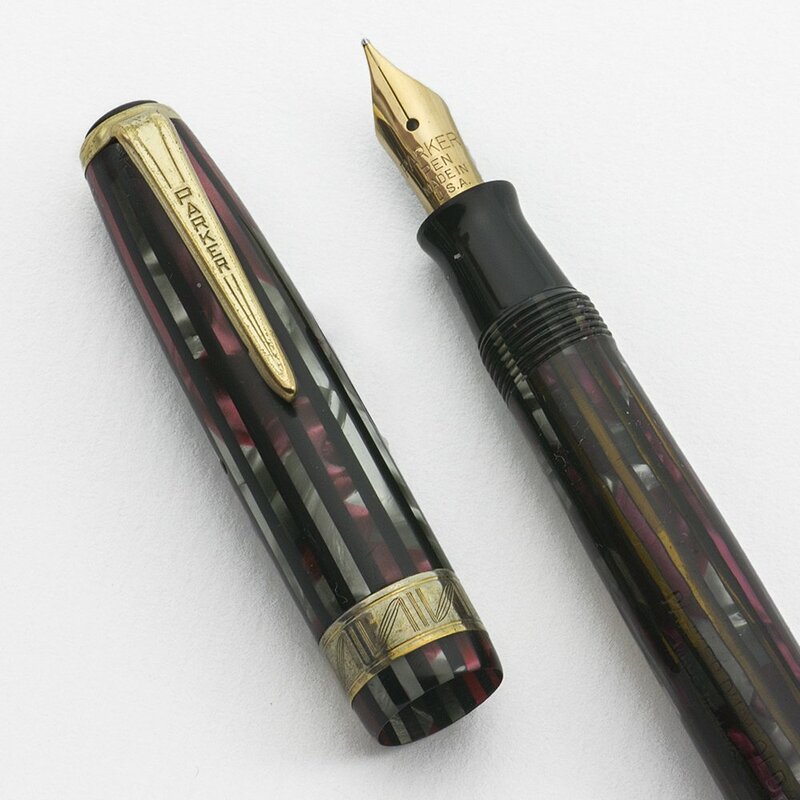 Parker "Duovac" Debutante Duofold Vacumatic fountain pen from 1945. Standard plastic vac system, maroon striped color with gold plated trim, a tapered clip, and a box ellipse cap band. Fine gold nib. Excellent condition. Fully restored and working well. 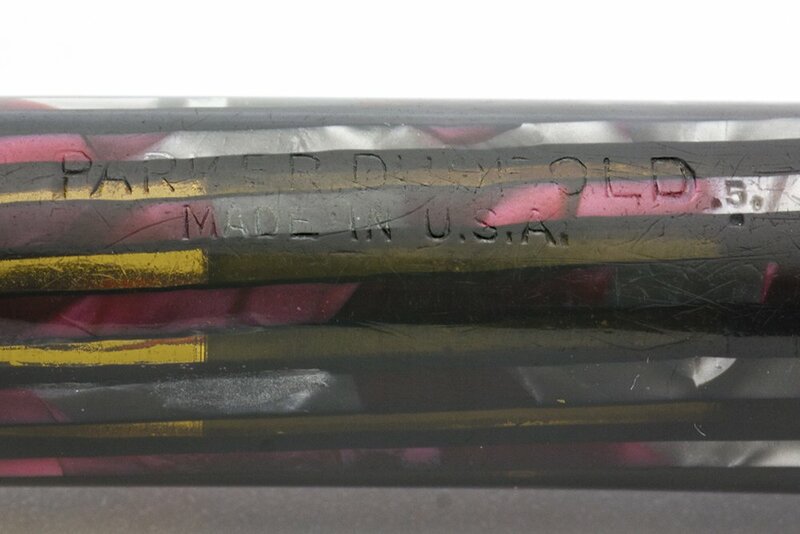 Product Name Duofold Vacumatic filler aka "Duovac" Debutante, based off of the trim. 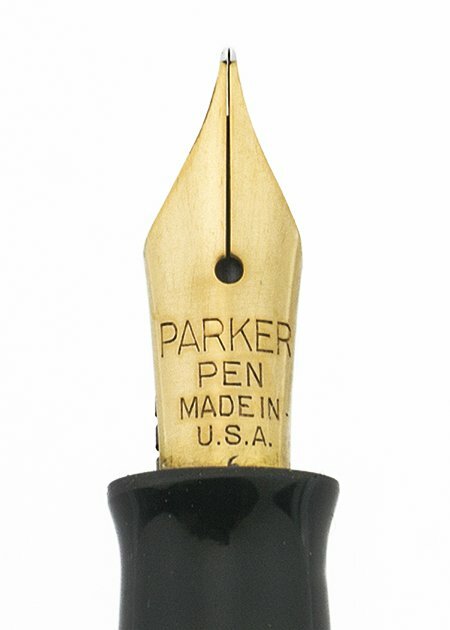 Manufacturer and Year Parker, made in U.S.A. -- 1945 (the date code is a clear 5 with three dots). Filling System Standard plastic Vacumatic filling system. We've restored it with a new diaphragm and it's working very well. It has the late era plastic plunger. Color "Maroon Stripe" color, stripes of black and stripes of various shades of burgundy and gray. Gold plated trim the ellipse box cap band that measures just under 1/4" and a black cap jewel. 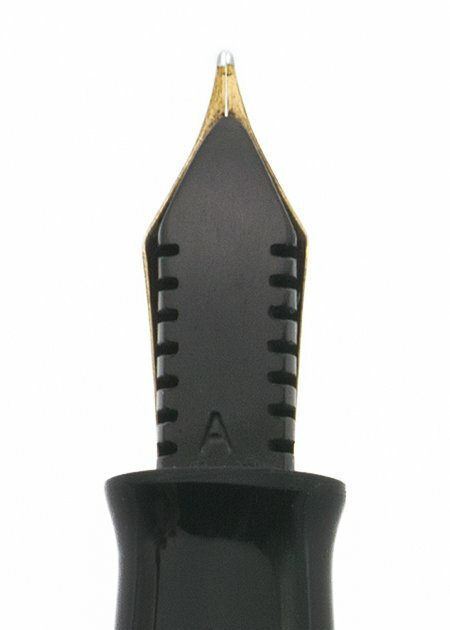 Nib FINE Parker gold nib. It's smooth and somewhat springy with nice tipping material. The feed is marked "A," which identifies it as an a non-standard feed. The nib has a date code of 6. Condition Excellent condition with major brassing on the cap band and minor plating wear on the rest of the trim. The blind cap doesn't line up properly with the barrel but it does match the patterning. The barrel transparency is very good. There are a few bite marks on the blind cap. The imprint is legible. There are no cracks or chips, dings, dents, or personalization to be found on this pen. It has been fully restored and it's working very well.